Where are Renters protected by Source of Income Anti Discrimination Laws? Section 8 Housing Choice Voucher holders across the country find it difficult finding a suitable rental home. Many of these failed rental searches stem from landlords who have blanket policies against accepting Section 8 voucher holders. In most areas, landlords are permitted under the law to openly discriminate against voucher holders. A simple search in your local Craigslist for rent listings will typically yield many ads containing the words “No Section 8”. In many areas of the country, this problem has become so bad that many new voucher recipients can’t find a landlord willing to accept their voucher and they actually lose their voucher before they ever can benefit from it, many times after waiting for years on a waiting list. In Oakland, CA, only 115 of 609 voucher recipients (18.9%) in the area found a unit with their voucher in 2015. According to the Chattanooga Housing Authority (CHA) in Tennessee, about two-thirds of the housing authority’s new voucher recipients lose their voucher before funding a unit. As a result, the CHA now hosts landlord fairs that allow voucher holders to have face-to-face conversations with several landlords who are looking for tenants. Even cities that have laws protecting voucher holders can face source of income discrimination. According to the New York City Commission on Human Rights 2015 Annual Report, source of income discrimination complaints quadrupled from 2014 to 2015. A few states, counties and cities in recent years have tried to address this problem by enacting Source of Income (SOI) discrimination laws. These laws typically include one’s source of income as a protected class under equal housing and other anti-discrimination ordinances. In many areas of the country, SOI discrimination is controversial. Landlords and apartment associations argue that SOI discrimination legislation mandates landlords to participate in a government program that puts onerous regulations, paperwork and costs on them. In Texas, after the City of Austin passed a SOI discrimination ordinance in 2014, the Austin Apartment Association sued to repeal the ordinance. 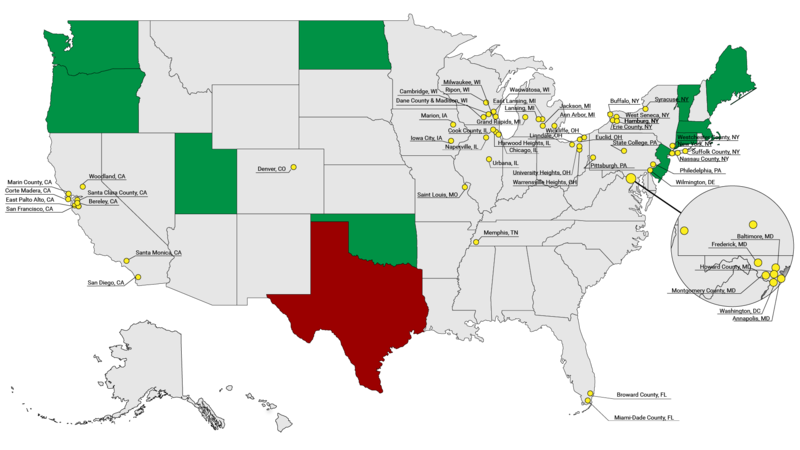 Acting exactly the opposite of state governments like Oregon and Connecticut, in 2015 the Texas legislature passed legislation that not only overturned Austin’s ordinance but prohibits any municipality in Texas from enacting SOI discrimination legislation. So voucher holders know their rights and whether there are SOI discrimination laws in their area, we maintain a list of jurisdictions that protect Section 8 Housing Choice Voucher holders from source of income discrimination. Where Are Section 8 Housing Voucher Holders Protected by SOI Anti-Discrimination Laws? The jurisdictions included in the lists above have passed laws specifically protecting persons who receive Section 8 or government assistance. While there are additional jurisdictions that have laws protecting source of income discrimination, we have not included those jurisdictions unless persons who receive Section 8 or government assistance were specifically identified. Where Is It Prohibited to Enact SOI Anti-Discrimination Laws? 1. Most of this information was obtained by a report from the Poverty & Race Research Action Council (PRPAC), which was last updated in May 2016. We are in process of independently verifying the information provided in this report. 5. According to PRPAC, "the Corporate Counsel refuses to enforce Section 8 cases." 7. The statute clearly prohibits discrimination against voucher holders. However, landlords can refuse to rent if the government program 1.) requires an inspection; 2.) the improvements needed to pass the inspection cost more than $1,500, and: 3.) the landlord has not received funds from the landlord mitigation program to make the improvements.